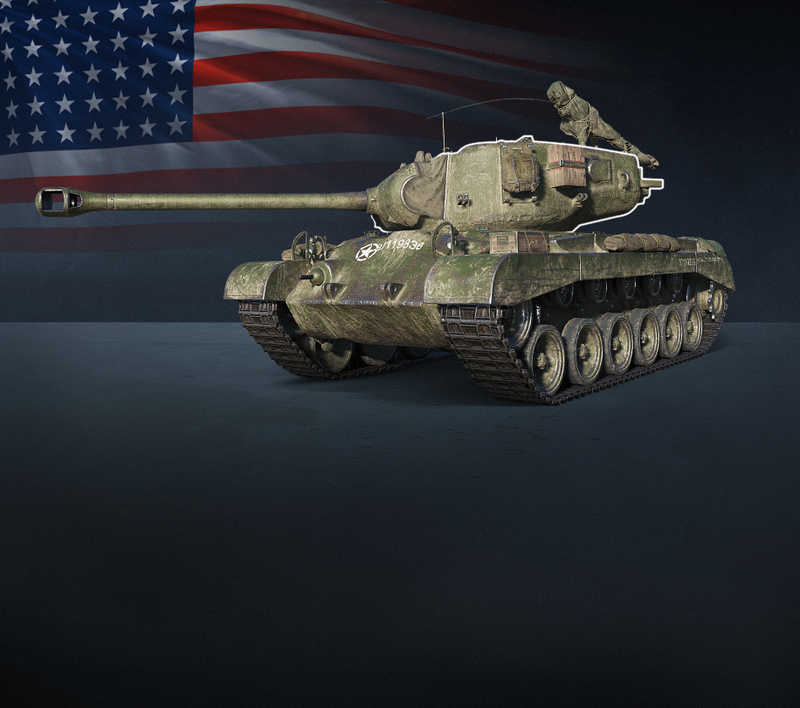 The T20-26 series of American tanks are well-represented within World of Tanks. If you've owned at least one of them, you'll be familiar with the playstyle: superb with hulldown mechanics, but flexible enough to contribute in any role and situation. If you love your Pershing or your Patriot and wish to expand your collection, you'll likely want this. For new initiates to the school of American mediums, this is also a good starting point to train yourself and your crew for a future vehicle. The Eagle 7 is based on a real-world American T26E3 (serial number 36), led by Sergeant Robert Early of E Company, 32nd Tank Regiment, 3rd Armoured Division. This T26E3 was deployed as part of Zebra Mission, with the aim of testing the new Pershing prototypes in Europe. It is most famous for engaging in a duel with a German Panther tank and emerging victorious during the Battle of Cologne on 6th March, 1945. The Panther had engaged two M4 Sherman tanks just moments before confronting Early's T26E3. It managed to destroy the first Sherman, causing the 2nd to retreat. Early's T26E3 subsequently destroyed the enemy Panther with several penetrating shots outside Cologne Cathedral without taking return fire. ...and that they panicked when the T26E3 suddenly fired at them while on the move, a fairly risky and uncommon tactic since most tank crews would come to a stop before doing so. The entire showdown was filmed on camera, a rare occurence during World War II. A fun-to-play, all-rounded medium: The Eagle 7 moves where you want it to, fires quickly and spits tank rounds more accurately than the average tank. You'll also get to bounce the occasional shot flying your way if you angle it right, but don't be fooled: you're far from invulnerable in this American vehicle. Great crew trainer and credit earner: Even if you're not looking to make the Eagle 7 one of your go-to tanks in battle, it's still worth a spot in your garage. Take it out for a spin when you're low on credits, or use it to train your crew before installing them in the vehicle of your choice. Great introduction to high tier battles: As a Tier VII, the Eagle 7 will constantly face opponents deadlier than Tier Vs or VIs, employing tactics that may not be present in mid-tier battles. If this your first time venturing into the late-game, this would be a great opportunity to learn what it takes to survive and excel in this environment. Not feeling the Eagle 7? "Hull-down USA mediums are boring." You might like the VIII Panzer 58 Mutz or the VIII T-54 first prototype instead. "It's not fast enough." The VIII AMX Chasseur de chars might interest you more. "I want to get up close and personal and live to tell the tale!" The Chinese or Soviet premium tanks may be more your style. "Needs firepower. MORE firepower." How about setting your sights on the VIII T34 ? The Eagle 7 has landed! Fresh off the development labs and currently live on the Premium Shop, the Eagle 7 is now available and ready to roll out! You've read all about the tank, now it's time to hop into one and experience it first-hand.